One knows by comparison and sometimes, as in Blake, through contraries. It is evident in the Songs of Innocence and Songs of Experience and less so in The Mental Traveler. The Mental Traveler pushes this notion of contraries further, from the poetic to a historical understanding of man. The poem, baffles at first but draws the reader in (like The Wasteland) to make meaning. At this stage, the idea is indistinguishable from society (“He plants himself in all her nerves…she becomes his dwelling place”). The idea which was unwelcome until then has become societies new norm. But neither are human affairs static or the “idea” absolute. The idea continues to live though gradually losing vitality. Individuals appropriate it to further their ends. They manipulate it in ways that appear beneficial to society, suggested in the lines “feed the Beggar & the Poor”. The idea is aware it is being manipulated (“His grief is their eternal joy”) but has turned into an “Aged Shadow”. The inherent contradictions within the state of synthesis throws up new thesis’s and anti-thesis’s and the “Aged Shadow” represents a new thesis. implies their union is a compromise as the old idea has to give up its earthly ideal in order to stay relevant. This “Maiden” is the antithesis to the “Aged Shadow”(the thesis). Their synthesis is the state where “he grows Younger and younger every day…. Like the wild stag she flees away”. Out of this synthesis appears “the frowning Babe” and the “Weeping Old Woman” i.e., a new thesis and anti-thesis and as Blake mentions “She nails him down upon the rock/And all is done as I have told”. The Mental Traveler was written in the years after the French revolution and Blake must have been aware of its ideals disintegrating into the reign of terror. 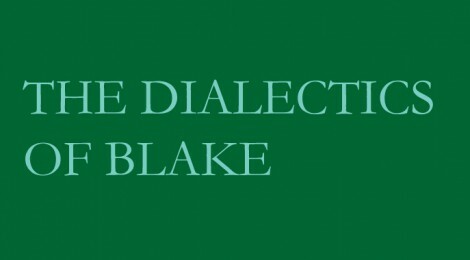 Was Blake influenced by Hegel’s triadic movement or had he anticipated Hegel in a different way? In a temporal sense Hegel’s dialectic moves from a lesser to a more perfect ethical state. One of the implications of Hegel’s dialectic is the responsibility he placed on nations. To quote Russell’s reading of Hegel (of whom he had little admiration), “In every age, there is one nation which is charged with the mission of carrying the world through the stage of the dialectic (triadic movement) that it has reached. In our age , of course, this nation is Germany”. When individuals (or nations) take on such responsibilities, the past has shown they turn despots. Blake’s dialectics does not reach for perfection. The end of his cycle returns to imperfection where his poem begins i.e., in the “frowning Babe” and a “weeping woman Old”. And as he suggests the following cycle plays out in a similar fashion i.e., in revitalizing and wearying humanity. Blake’s suggests both contraries are essential for … ? for what? for which greater good? To answer that question is to repeat a Hegelian error of expediency. Blake’s vision stays closer to the truth and his poem truer because of that. Mathew Joseph lives in Bangalore. His poems have won prizes at the Unisun Reliance TimeOut writing competitions. Some of his poems have featured in Eclectica and Cha: An Asian literary magazine.